As I was writing about why Evernote was essential to my business 3 days ago and getting ready for the lesson for my team, it would be better to further deliberate on some scenarios why Evernote could boost your sales instead of just plain boasting about that green elephant. These are some snippet applications on what you could use your Evernote for in Real Estate. Write your quarter goals for 2014 (Q1, Q2 nada nada) and have them broken down into what you would be doing on a piece of paper? I use Moleskin because I’m a sucker for quality products, but hey, a 555 jotter (your childhood 10cents book) will work here. 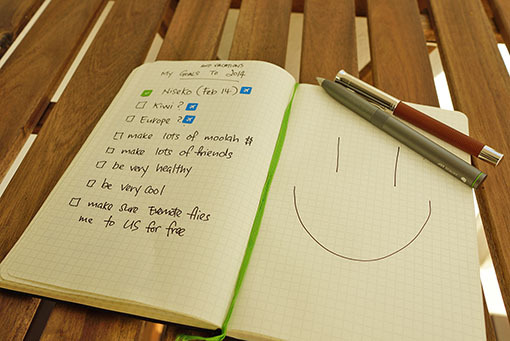 Write down everything you want to do for 2014 and snap shot with Evernote ‘Document’ camera mode. Until Adonit’s Jot Script Stylus for Evernote happened. It improved a fair mark on how we take notes with their well designed stylus. Sure there’s still a slight lag but its negligible. You could use your iPad to take photos and annotate with your own handwriting and jot down notes immediately. Within seconds, your Penultimate note appears in your Evernote account to all devices since they sync to cloud. Extremely useful when you need to refer to notes which you took down as Penultimate scribbles are also recognized via Evernote’s OCR capabilities. Unless you write like a doctor, Evernote would be able to detect your handwriting. This is good for taking notes in a Client’s apartment on what to improve, or measurement, or even suggestions to let them know what you can do for them. 2A Andrew Avenue is wow! 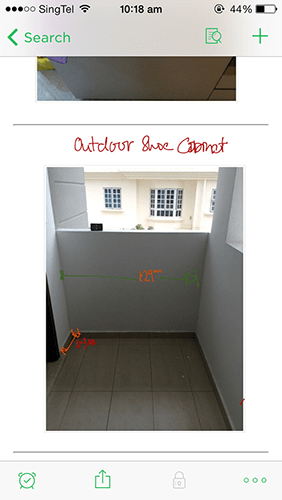 Prior before Penultimate, I use this very often to annotate photos. Skitch is really easy for you to annotate any images or screenshots on the move and you could have it immediately sent out for team play or action. I use it mainly to annotate on programs or softwares which Bruce and I are developing for the team, by giving instructions on the logic of the programs or annotating bugs. 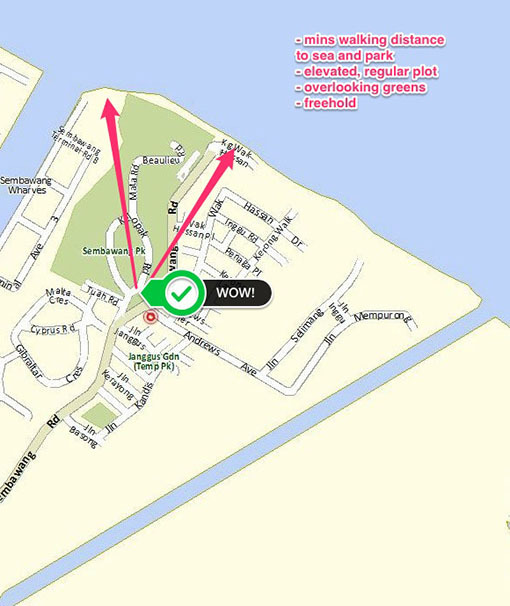 Otherwise, It’s still good to use Skitch to do simple cropping, or annotate items on maps, also to be able to show things easily by highlighting selling points on a map to your buyers. One of my favorite add-on. This allows me to keep track of my viewings with any co broking friends when I meet up with them. By simply just snapping a photo of their business card, I would have their details, find them on Linkedin, and have them added to my contacts. This is useful as you would have a record on when did you do your viewing for the particular property and you prepare some notes for it so that you do some reference later on how you are doing. Also you would be able to impress your friends on where did you meet them and how many counts did you do it. 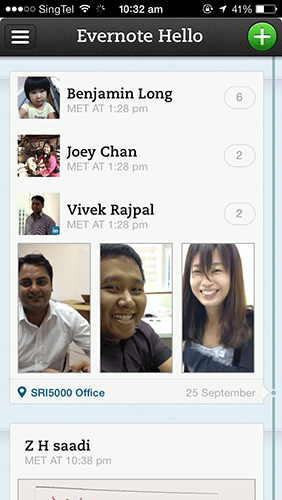 Apart from using Hello on namecards, you could try to be more creative. When you travel overseas, instead of writing a long journey of what is happening, you could connect via Hello with your partner and have some photos taken, place it on Hello and you have a quick journey log. Realtors travel quite a fair bit. We have breakfast, lunch and dinner out all the time. 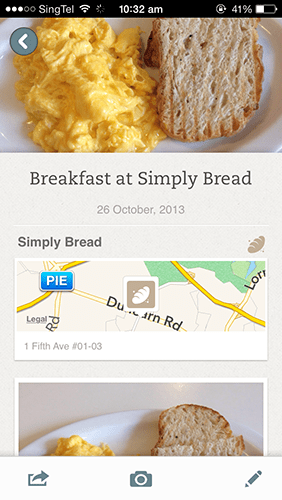 This is a fun app that allows you to take food logs of what you had and leave some comments. Search your food on Evernote account and you’ll get it with how many times have you visited. It works when you travel overseas as well. Good way to reminiscence great food for sure (or remember the bad ones). Yes, we’re in a food haven country, and logging some shots and notes of your typical char kuay teow or hokkien mee stall could be useful to some of your other friends when they discover these notes shared in Facebook as well.